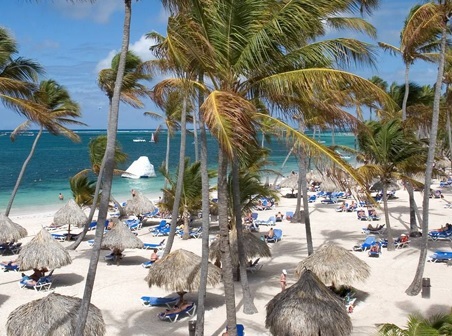 Tourism in Punta Cana has changed in the last 10-20 years. 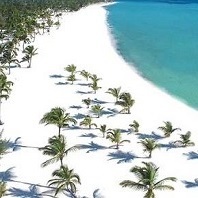 The fact that Punta Cana has the best beaches and the best landscape on this planet is no longer a well-kept secret known to only a few independent travelers .... The word is out! 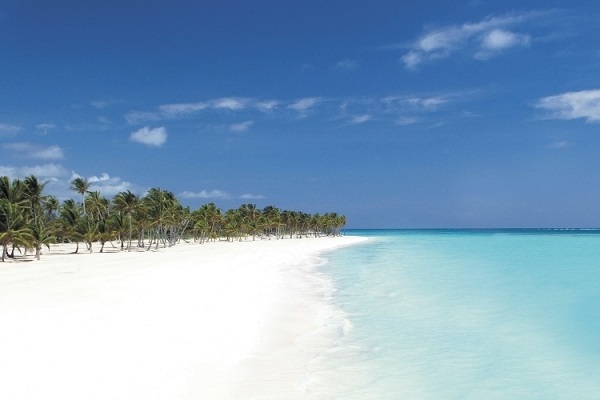 With a length of 50km (30 miles) Punta Cana has some of the most beautiful beaches in the entire Caribbean. Coconut trees which extend to the sea, fine white sand beaches as far as the eye can see and the warm turquoise sea. That's Punta Cana. Here you will find 60 large hotels (All-Inclusive) and there will be even more in the foreseeable future. Punta Cana boasts the largest number of hotel rooms in the Caribbean. The infrastructure in this region is getting better and better. The village Punta Cana is actually just a small hamlet with three hotel. 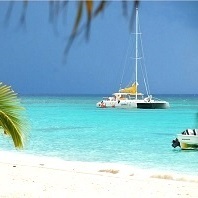 But the whole vacation region in the east of Island (50 km from Higuey), is referred to as such. 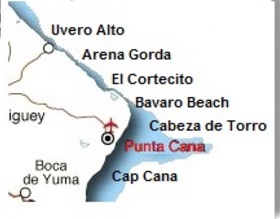 This consists of the towns of Cap Cana (Juanillo) Cabeza de Toro, El Cortecito, Bavaro, El Macao and Uvero Alto (from south to north). 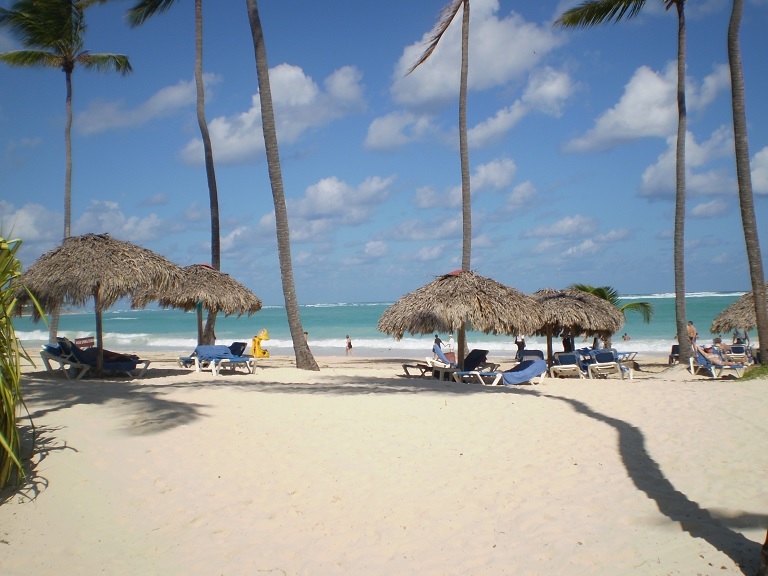 Of the nearly 4.0 million tourists annually in the Dominican Republic, 60% alone come to Punta Cana. 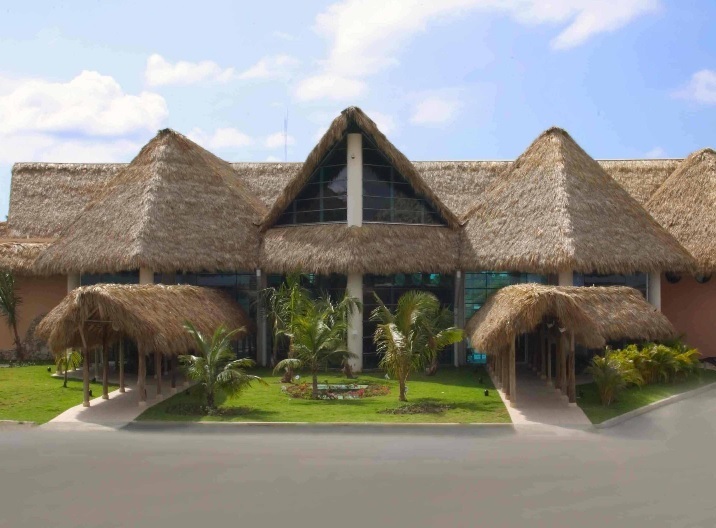 The International Airport of Punta Cana is situated in the village Punta Cana. Most tourists visiting the region land here. Anybody who arrives for the first time will be surprised by the unusual architecture of the buildings. The airport getting busier each year. At present alone from the U.S. weekly in about 100 flights arrive and the number is rising. Last year, a state of the art radar system is installed and with this the airport can complete with any airport in the world. 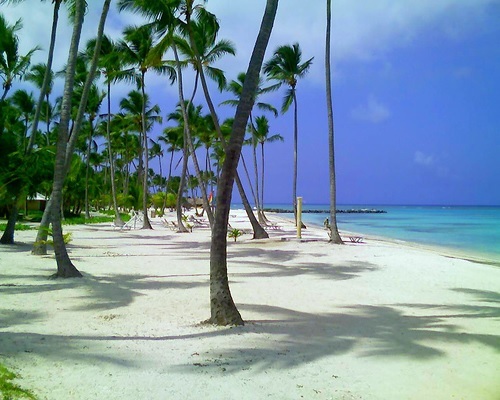 The largest vacation destination of the east coast -with many hotels- is Bávaro. There are shopping centers such as Plaza Bavaro, Plaza San Juan, Plaza Punta Cana, Plaza Brisas, Riviera Plaza, Plaza Progresa and Plaza Caney. 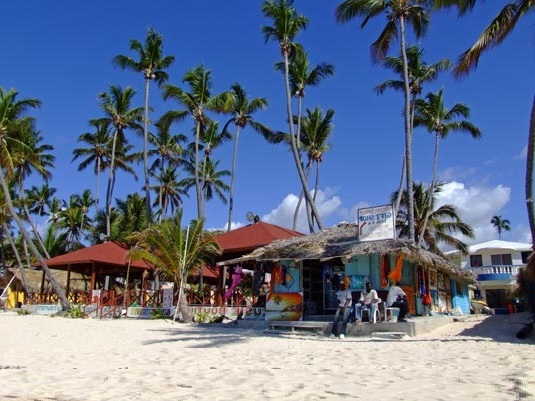 In Bavaro you will find a new modern hospital, four banks, a large supermarket, many souvenir shops, restaurants, nightclubs, bars, doctors, pharmacies, a bakery, dry cleaners and much more. From here the public buses (Guagua) to Higuey or the express buses directly to Santo Domingo depart. In El Macao you can get to the Playa Bonita. A beautiful beach, what the name already says, with an adjacent rocky hill, facing the sea. From there you have a magnificent view over the sea and a ship- wreck, which is used by the local dive shops to dive. In Macao there are no hotels (how much longer?). The sea is beautiful, high waves, inviting for swimming and surfing. A particularly popular trip with the tourists is the one with ATV's to Macao. You will drive several kilometers past the lush vegetation along the beach. The highlight of the half-day excursion is a refreshing dip in a cave with the name Pozo Azul (the blue fountain). 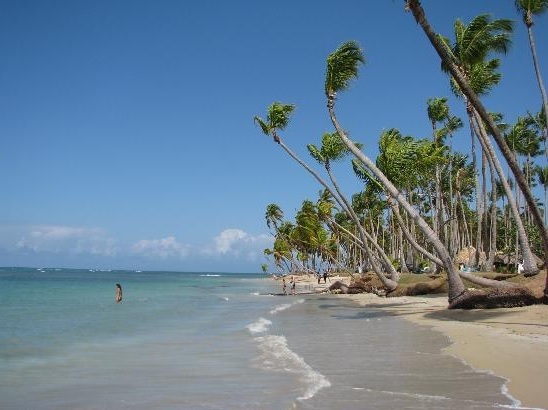 The name means "fat sand" and the name is appropriate, as this is one of the widest beaches in the DR. Arena Gorda slopes gently into shallow, generally calm water, so it is a good beach for swimming and relaxing. Get there early to claim a shading spot under a palm tree. 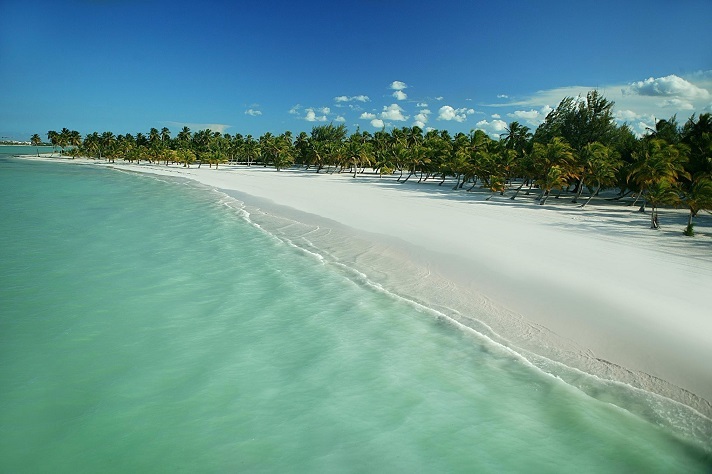 Three resorts - Barcelo Punta Cana, Grand Bahia Principe Bavaro, Iberostar Grand Hotel Bavaro - have Blue Flag beaches. Arena Gorda is an exceptional beach. In El Cortecito, a small fishing village, you will find many small shops, a supermarket, several restaurants, private hotels and apartments. Directly on the beach you will still find a lot of booths and stalls where the locals sell souveniers. The most famous restaurant in Cortecito is "Capitan Cook", where over a wood grill lobster and a variety of fish are cooked. Many celebrities (eg Bill Clinton) have been here. In Cabeza de Toro there are 3 large all-inclusive hotels. Here you will also find the Nautic Club of Santo Domingo, and it is the base of the Marina Guerra (Coast Guard), responsible for all beaches in Punta Cana. There are also good fish restaurants, bars, nightclubs and an apartment complex with a private boat dock. In Cabeza de Toro there are still many traditional fishermen and you can watch them coming in with their daily catch. If you drive from the airport in a southerly direction along the coast, you end up in the fishing village Juanillo. Juanillo has a picture perfect beach. A paradise for children and adults, as this shallow turquoise sea basin, functions like a giant bath tub. On Sundays and on public holidays locals used to picnick here with loud music and lots of Presidente or rum. During Easter Week "Semana Santa" thousands of Dominicans met here to enjoy the largest folk festival of the east coast. Everything written above about Juanillo, is a thing of the past since 2012, because the fisher village Juanillo doesn't exist anymore. 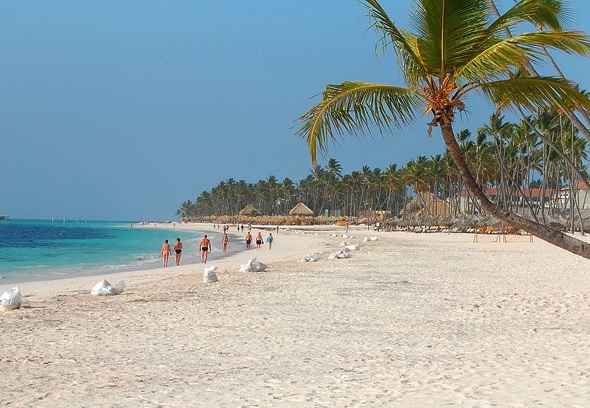 This stretch of coast is now called Cap Cana and is developing over a length of over 4 km to the largest hotel and leisure complex in the Dominican Republic. The facility, which also has its own marina, gets to be even bigger and more luxurious than the resort "Casa de Campo" near La Romana. What to do, when you are there?